A few weeks ago, I took some time to evaluate where most of my clients come from and the two areas where I consistently receive highly qualified clients are referrals from happy clients and public speaking. It’s essential that you spend your valuable time doing the things that consistently bring you the clients that you love to work with. This week, I’m going to focus on public speaking as I get many questions from Smart Women on this topic. Speaking to your target market is a wonderful way to reach more people in a short period of time and get your message out about how your product or service can help them. It works well because your target audience can get to know you on a more personal level and get a feel for your style and personality. You may be reading this and thinking, “I’ve never done any public speaking and I’m not feeling very confident about it.” I understand completely. I started speaking 15 years ago because I had a mentor at the time who insisted this was a great way for me to grow my business. It was not by choice and I tried (unsuccessfully) numerous times to avoid the process. I remember my first speaking engagement. I had purchased a $300 silk suit to wear for the occasion. I was so nervous that I was sweating the entire time. By the end of the presentation, I was soaked! The suit was ruined. I sent it to the dry cleaners but it could not be saved. After that first presentation, little by little, I became a better speaker and more confident in my ability. 1. Choose a Topic – Pick a topic where you have expert knowledge. Think about a problem or challenge that you solve for your clients. Create a presentation around this and include 3-5 main points that will be benefit your audience. 2. Use the KISS Principle – Divide your talk into 3 main areas. The beginning is your introduction where you create a desire for the audience to listen to you by sharing your level of expertise. Don’t forget to share your vulnerability as well. People love hearing that you’re not perfect and you’ve made mistakes too! The middle is the 3-5 main points you want to share on your topic. The ending is where you let them know how they can get more information and how they can work with you. 4. Give Them Something to Buy – If you have a table at the event (many events offer a table to speakers at little or no extra charge) display your products and brochures. After you finish speaking, get back to your table as quickly as possible so that people who are interested in asking questions or interacting with you can approach you easily. 5. Follow-Up After the Event – After the event is over, make sure you follow-up with the event host and find out how they felt about your presentation. This is an excellent way to learn what went well and if there are some areas for improvement. Be sure to ask the host for a testimonial about your speaking. This is an invaluable tool to have on your web site media page and marketing materials. You can start with a small group (5-10 people) and move on to larger audiences along the way. Over the last 15 years, I’ve spoken to groups of people that had an audience of 5 people as well as groups of up to 750 people. The number isn’t what’s important. The key is to inspire a few people who identify with you and want to work with you to help solve their problem or challenge. 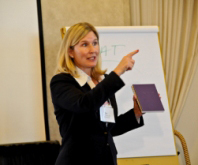 Speaking has made a tremendous difference in my business. It can make a difference in your business too. WANT TO USE THIS ARTICLE IN YOUR E-ZINE OR WEB SITE? You can, as long as you include this complete blurb with it: Joy Chudacoff, ICF, PCC, is the founder of Smart Women Smart Solutions®, a Professional Certified Coach to 1000’s of women, Motivational Speaker, and Entrepreneur. She publishes a weekly buzz generating ezine, Reflections On Life and Business for Women Entrepreneurs. If you’re ready take your life and your business to the next level, get your FREE Tips, 2 FREE Reports and FREE MP3 now at http://www.ProfitsWithPassion.com .